There is this indescribable feeling of happiness when it's announced that a London designer is opening a flagship store. There is a myriad of burgeoning business in the city and it's always pleasant to see them achieve great things. This past year Simone Rocha quietly launched a store on Mount Street. A soiree to celebrate was held during fashion week. Canadian designer Erdem Moralioglu also opened the doors to his first store, in Mayfair. The location of the store is a felicitous move. After all, the Erdem woman is a globetrotter, she ranges from a lawyer to a doctor to an art curator; she lives in various domains. It seems only fitting that she plonks herself in swanky Mayfair when she arrives in London, the label's domicile. Settling into his new digs smoothly, Erdem welcomes guests to the downstairs showroom at the South Audley Street store to view the pre- collections. 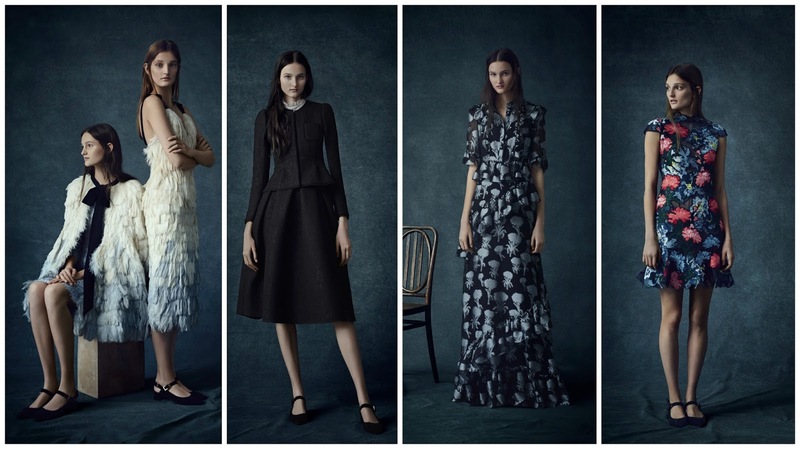 Though some designers sigh at the idea of having to design them, Erdem begs to differ. In fact, he is a huge fan. Speaking to Sarah Mower at Vogue Runway he says, "something always tends to come out of them that turns into an idea for the runway." That is the beauty of the pre-fall or resort collections. It's a preview to what's to come. In recent seasons I've noticed the inclination behalf of the designers to present a watered down version of last season? Luckily with Erdem, there is always a shift towards something new. This season Erdem referenced American portrait painter John Singer Sargent. A "leading" artist during the Edwardian era - a macroscopical trend of the season. The beauty in the reference however stems from the lookbook images. Like a strong piece of art, you find yourself lost in it. The photo and, especially, the clothes. Luchino Visconti films and Sarah Moon’s photographs were other sources of inspiration. Imbuing the collection with snippets from each era, 1920s to 1970s, the presentation certainly benefitted from such time travelling. Instead of a shaggy fur cape, from the ’70s, Erdem opted to layer ostrich feathers, completing the look with a black bow. Stepping out of the 1920s, a pink shoulder-less halter gown with layered ruffles featured polka dots; from the 1940s came a black skirt suit. Given that a pre-collection does feature more streamlined, not-so-risque shapes, Erdem presented a series of dresses that got more and more beautiful. From dip-dyed ostrich feathers, to a floor length floral embroidered gown, and lace-trimmed to polka-dots, sparkling gold to a vivid image of a plush garden. It all culminated in a ruby-hued gown with a dozen carnations printed here and there. Splendid. There is a level of dilution at play in every pre- collection, as aforementioned. However, Erdem provided some intrigue and context. The women in those pictures were scarily beautiful; dressed in the finest of clothing. Ultimately, the clothes brought the image to life, in a way the author expertly chooses words to lift characters from the page of a great novel. Erdem is like an author in that respect. He’s capable of descriptively painting a picture of a character - his woman - through the medium of fashion.